To go with the others, Trafalgar Street nearing its end - so the caption says - though it looks like Thomas Street to me. Hi Neil, I'm kind of with you on this, however the next block of 8 storey flats along form Givens House, forget the name (although it could have been Trafalgar House), was adjacent to Vincent Street and I think that's the view, so the Telegraph is correct if I'm right! Cheers Mods - though it looked like the row in my image on post 322? The barbers pole mentioned in this post belonged to my great grandfather Harry Hopkins, who traded there from about 1890. NeilsYard, I remember Godfrey's the newspaper (& general shop). The owner had lost an arm (WW1?) but could fold a paper with one hand, stick it under his damaged underarm, and then hand it to the customer with his good hand in one swift motion! My grandfather bought his newspaper (and Black Cat cigarettes I expect) there and then went to the Allesley bus stop just inside Holyhead Road to return home to Coundon. Nice ones Prof, thanks for sharing. There was only one Court 48 on Spon Street, previously known as Stretch Yard and had properties on both sides - as evidenced by your relative living at number 23. The properties at the front are hard to number but somewhere between 173-176. The way I try to work out the numbers is to count doorways from the nearest pubs but I get a different value from the two directions. Modern numbering doesn't help. The yard entrance today would be where the gates are for the compound with the substation on the north side of the street. On this map the yard is under the O of Old-Maps on the north side of the road. I've got good pictures either side of this bit and some distant, slanting images but that section is poorly covered. I do know that a photo of L Liggins at 174 is the best (shows woman at the door of a butchers with dead birds hanging all along the window, not in the library collection but several books have a copy of it). Not exactly sure which building it was but my guess is that the passage way to court 48 was to the right of that shop with a tiny building in between (more of a continuation of Liggins building than a new building). 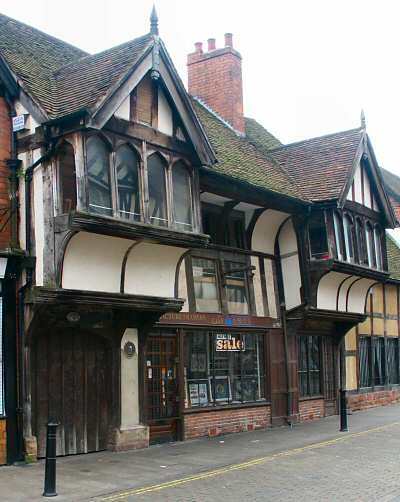 The passagway was probably under the next full building, which was a flat fronted, half timbered building. The right hand side of that building you can see in the very left of this flood picture. In this picture, the entrance the court 48 is halfway between the post and the person crossing the road.